This song veers off a little from most of the other music I put on this CD. However, it is a fun song that just screams out Christmas to me. 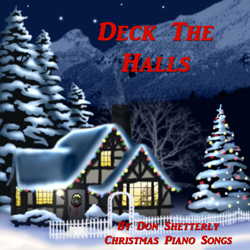 Deck The Halls is more of a secular song rather than a religious one. While I cannot say that I played this one a lot growing up, it was still a fun song to get the fingers moving on the piano. Track #12 of 15 songs on Christmas Piano. This old Christmas carol began in Wales. It was a custom to leave all the doors unlocked on Christmas Eve so the Holy Family wished to enter. This gay and lively song is now sung all over the world, especially when the house is being decorated for the holidays. The melody is actually Welsh but the words are American. Mozart used the music in a piano/violin duet. The tune to this song originated around the 16th century. It has been stated that the repetition of nonsense words was very popular in music at the time. Over time, there have been many variations of the music especially with the words. The older English lyrics bear almost no resemblance to the Welsh.